Begun in 1913 by patriotic overseas Indians, the Ghadar Movement was remembered at a centennial celebration at Global Mall in metro Atlanta on 29th June 2013. Keynote speaker was former premier of British Columbia, Hon. Ujjal Dosanjh; Consul General Hon. Ajit Kumar was the patron of the evening, and visiting Member of Parliament Mumammed Hamdullah Sayeed also graced the occasion. 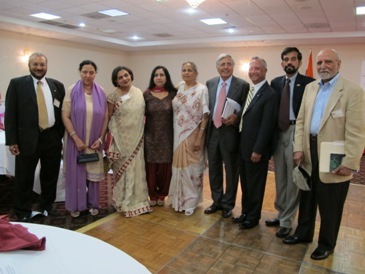 The event was organized by India American Cultural Association (IACA) and The Global Organization of People of Indian Origin (GOPIO) under the patronage of the Consulate of India in Atlanta. Mr. Kaushal Tripathi, President of IACA said in his opening remarks “after tonight’s banquet we will be more educated, enlightened, and appreciative of the sacrifices made by the GHADAR heroes,” and he quipped that it took us almost 100 years to write a complete book on the Ghadari babas. Ravi Singh, Manohar Singh, and Bhagirath Yadav conducted the course of the evening. 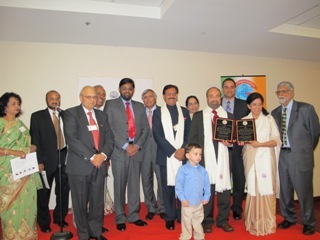 Mr. & Mrs. Manohar Singh of IACA, GOPIO Atlanta chapter president Bhairavi Nadgonde, also Mrs. & Mr. Ujjal Dosangh, Narsi Narasimhan, Ravi Ponangi, and Dr. Garcha pose at the Gadar Centennial. Hon. Ujjal Dosanjh (fourth from right), in his keynote address, said the Ghadar movement must be made part of India’s history by law and commitment. He insisted not to insult the memory of Ghadari babas by pigeon-holing the celebration to the NRI commemoration day. “The Ghadar Movement was an integral part of the history of India’s independence,” and should be treated as such. Dosanjh stressed the need for national spirit to rise above regionalism in today’s world and in Indian politics. “I am dismayed by Indian politics,” he said. “It is getting more regional. I don’t see the national spirit. If you want a greater India, keep your religion at home, like the Ghadarites did,” he added. “You need the national spirit of the Ghadar Party if you want to progress here in the U.S. and Canada, too.” Think about the larger interest, not regional interests, was his advice to the gathering. The Canadian politician said he had agreed to attend the celebration in Atlanta because it was hosted by an Indian association (IACA), and not a regional group. “There is no contradiction in feeling like a great American and a great Indian,” he concluded. Consul General Kumar also spoke, saying that the Ghadarites were a unique set of patriots. “This was a movement of progressive, democratic, secular people who represented only one religion—that of patriotism.” Kumar added. The Ghadar Movement inspired and influenced many subsequent leaders like Bhagat Singh and Netaji Subhash Chandra Bose, the Consul General added. Grandchildren of Gadarite Bhagwan Singh Gyanee: Surinder Pal Singh and his sister Balwinder Kaur Singh being recognized—with Paddy Sharma, Manohar Singh, GOPIO Chairman Inder Singh, Kaushal Tripathi, also former premier Ujjal Dosangh, Consul General Ajit Kumar, Mrs. & Mr. S.P. Singh, MP Mumammed Hamdullah Saye, Balwinder Singh. He said Americans honor their heroes on Memorial Day, but the heroes of the Ghadar movement remain unsung. “Is there any community organization that will take this up?” he asked. The Ghadar Memorial, which housed the headquarters of the movement, is now being converted by the Government of India into a library and museum, he added. Atlanta based Surinder Pal Singh, who is the grandson of Ghadarite Bhagwan Singh Gyanee, spoke about his grandfather who left his wife and son in India in 1913, and never saw them until 45 years later. He said, when his grandfather finally returned to India in 1958, and his feet touched Indian soil, he prostrated on Mother Earth and his first words were, “Vande Mataram.” Bhagwan Singh Gyanee died in 1962 and was cremated in the Himalayas, per his wishes. In the four years that he was in India, he authored several books. Congress MP Mumammed Hamdullah Sayeed said he was touched by Surinder Singh’s appeal. “The Government has not forgotten,” he said. “I have put aside all engagements to be present here at the centennial celebrations of the Ghadar Party. In every system, there are good people and bad people.” “Do not be pessimistic about the system,” he added. Sayeed was 26 years old when he was elected to the Lok Sabha from Lakshadweep in 2009. 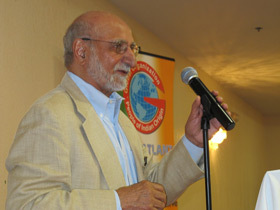 Dr. Bikramjit Garcha, Professor Emeritus, Decision Sciences, at Georgia State University, said the Ghadar Movement was a fearless, well planned, and well connected movement. “Most of the revolutionaries were farmers who had come here to improve their lives. But what they saw and felt aroused them. Their plan was to go to India from all three sides,” he added. GOPIO Atlanta chapter president Bhairavi Nadgonde also spoke. Attendees enjoyed performances: Sagnika Mukherjee danced in Odissi style to “Basant Pallavi” and to her choreography of “Vande Mataram.” Students of Planet U performed to “Rang de basanti,” and “Jai ho.” Dr. Birju Vaishnav played the flute. 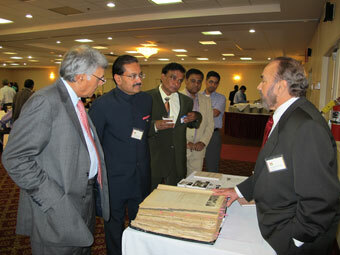 A display of Ghadar memorabilia items and a book sale will be at the Festival of India 2013 in Gwinnett Center on 24th August.